The Basin is one of Sydney's secret natural gems - explore it's beauty and wildlife with a One Hour Self Guided Kayak Tour. The Basin is one of Sydney's best secrets - discover it's beauty and wildlife with a Three Hour Self Guided Kayak Tour for Two. 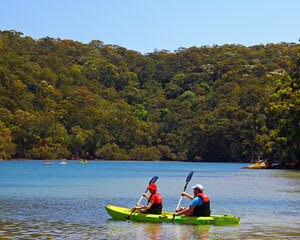 The Basin is a beautiful calm water bay in the Ku-rin-gai Chase National Park located just north of Sydney. Your one hour kayak hire includes all safety equipment as well as expert advice on kayaking technique as well as wildlife to keep an eye out for before you set off. A tranquil kayak trip on flat water surrounded by pristine bushland abundant in local wildlife is the perfect way for you and your favourite person to escape the hustle and bustle of Sydney. Get back to nature without going to far.